Here is one of the best bags ever made by Louis Vuitton. This tote bag is special in the lack of a better word. This means that it looks like no other bag, it comes with unique features and it brings a lot of innovations. Louis Vuitton Damier Azur Propriano bag is designed for this summer and it is definitely going to become a game changer. The chic and stylish design is a masterpiece without any doubt. Then we have high-end materials which have been used in the manufacturing process. All of that means that the tote bag is great in any way you can imagine. Let’s start with the exterior. Braided handles and braided leather piping are the main features here. They are functional and they look stylish at the same time. A tassel is the next main thing. It has been optimized to make the entire bag look more appealing to younger women. In addition, the main material here is Damier Azur and the lining is Rose Ballerine. The combination looks especially appealing and durable, which is definitely important when it comes to LV bags. Now the additional elements of the bag. It features 4 press studs and 4 bottom studs. All of them are added to make the bag even more durable and to protect the items inside it. Metal hardware comes in gold color, so it is stylish and it looks perfect. Inside we get more space than most women actually need. 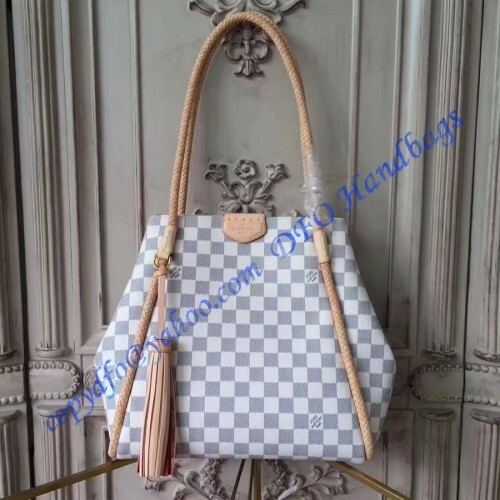 It is truly impressive how designers at Louis Vuitton were able to make a bag with so much space inside, but kept is lightweight and practical at the same time. You also get a zipper pocket inside which is more than just essential nowadays. Keep in mind that the interior lining will protect all your items and belongings and keep them perfectly safe. At the end, all we can say that this bag is modern, sophisticated and practical. It is a great choice for women who are looking for a summer bag to actually use it. The look of it is superb for those who need a business bag and for those who need a casual bag for everyday use. We can only add that the bag is more than just appealing in any way.